The Bombay High Court bench comprising of Justice V.M. Kanade and Justice P.D. Kode observed that a mechanism should be developed to prevent custodial deaths and excessive use of force during interrogation. A Division bench of the Bombay High Court comprising of Justice V.M. Kanade and Justice P.D. Kode slammed the Seven Hill Hospital in the city for harassing a patient for part payment of the bill. The court termed this practice of detaining patients as ‘inhuman’. The Court also observed that nowadays hospitals are being run like shops and that “doctors have forgotten their duty”. The Kerala High Court, in a petition filed by borrowers in a loan transaction, held that a notice under SARFAESI Act to be valid and effective in law should be issued by a secured creditor or an authorized officer. Hence, only an officer of the bank, as specified by the Board of Directors, can issue a notice of demand, and not the lawyer. Justice B.Kemal Pasha of the Kerala High Court ordered the arrest of a vessel, M.V.Miletus, flying a Marshall Islands flag, involved in the hit and run case off the Kerala coast. The ship will be arrested at Bhavnagar port in Gujarat. Justice A.M. Shaffique of the Kerala High Court upheld the validity of a State Government decision reducing the qualifying percentage for service quota in the All India Post-graduate Medical Entrance Examination 2014 by in-service doctors for admission to postgraduate/diploma medical courses. A Madras High Court bench comprising of Justice N. Paul Vasanthakumar and Justice M. Sathyanarayanan declared that even a trivial misconduct by a public servant can be the cause of his dismissal. The amount of money involved or the gravity of offence shouldn’t play any role in determining whether he should be reinstated or not. The Madurai Bench of the Madras High Court has passed an order, directing Gujarat National Law University, which is the organizing University of Common Law Admission Test, 2014, for addition of the Tamil Nadu National Law School (TNNLS) in Srirangam on its official website as one of the participating colleges. The Silvassa police have received direction by the High Court of Bombay to publish an apology for releasing the picture of Hasmukhbhai Patel, caught in a civil conflict. “Issue the apology and see that it is printed on page one of the newspapers,” observed the bench consisting of Justices VM Kanade and PD Kode. 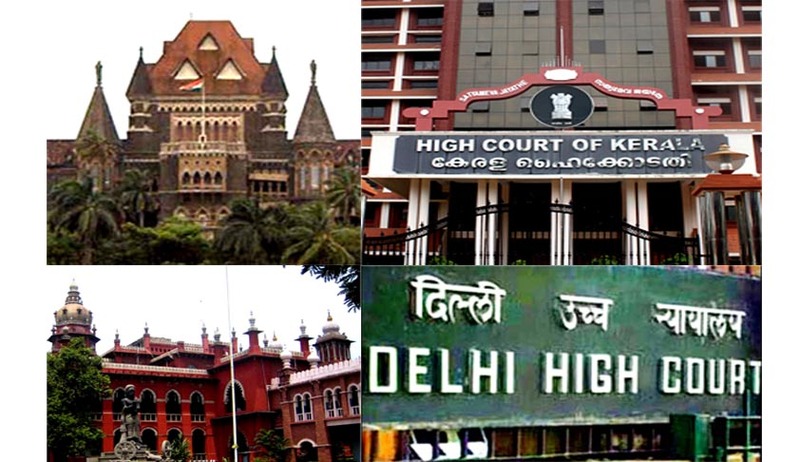 The High Court of Kerala in a significant judgment has ruled that even though there are no arrangements between the Government of India and the Government of a foreign country under S.285(3) of the Criminal Procedure Code (CrPC) it would not be a bar for examining a witness by video conferencing. In the judgment Nabeesathu Sudheer @ Mondi Sudheer v. State of Kerala, the division bench also held that an omission to take oath or make any affirmation will not invalidate any proceeding or render evidence inadmissible under Section 7 of the Oaths Act, 1969, and that if any party to criminal proceedings is aggrieved on any technical ground he must raise objection only at the earliest stage and if the objection was not raised at the earliest stage, he cannot be heard on that aspect. The judgment was delivered by the division bench consisting of Judges, K. T. Sankaranand M. L. Joseph Francis.